GerdRüdiger Lang, given the title—with equal measures of reverence and affection—of Mr. Chronograph by many, has always been one to speak plainly, never silent on the subject of who was and is involved in his ticking treasures and what they do. In fact, the trained master watchmaker tends to call a spade a spade. He has, therefore, named one of his iconographic timepieces and its exclusive inner workings not chronograph, but—quite correctly—Chronoscope. In so doing, Chronoswiss, the Bavarian watch factory behind this timepiece is taking a look at the origins of that which is regularly referred to today—with a certain carelessness—as a chronograph. In 1844, a resourceful watchmaker from the remote Vallée de Joux by the name of Adolphe Nicole came up with a small heartshaped disk that allowed the second hand, which could be stopped independently of the movement, to be reset instantaneously from every position. Nicole attached an equally clever control mechanism directly to the base plate under the dial, connecting the chronograph to the “motor” when needed—very much like the clutch in a car. Because the French word for “dial” is cadran, and French is of course the watchmaker’s language, such underdial mechanisms are known as cadratures. Unlike the chronograph patented in 1821 by NicolasMathieu Rieussec, which marked the stopped time in ink directly on the dial, Nicole’s creation only displayed it. Thus, logically, his invention had to be called a chronoscope if the name was to be accurate (from Greek skopein = to see, in contrast to Greek graphein = to write). For GerdRüdiger Lang it was therefore a matter of honor that he christen his freshly developed chronograph—presented in 2002—with the elegantly simple, yet technically absolutely correct, term Chronoscope. Recalling the chronograph pioneers of the previous century, Chronoswiss attaches its complex cadrature, which was developed in collaboration with Swiss watchmaker Andreas Strehler, directly onto the base plate of Caliber C.122 as was customary among the old masters. This is not just any old commonplace movement, but rather a highly exclusive affair that can only be found nowadays at Chronoswiss. This automatic movement, Chronoswiss Caliber C.122, has been thoroughly optimized, painstakingly finished, and ideally modified with the inclusion of an offcenter hour hand at 12 o’clock. Chronoswiss has made a significant investment in the Chronoscope’s base plate, creating special milled and drilled areas for the added chronograph mechanism; the start, stop, and reset of the sweep chronograph seconds is handled by a single crown button. Inside the movement, a classic column wheel rotates intelligently around the staff of the continuously running second hand at 6 o’clock, ensuring that the event sequence runs smoothly when using the chronograph function. The dependable vibrating pinion connects the movement to the chronograph module. Chronoswiss regards its chronograph wheel as an expression of modern horology, borne on ball bearings, it is the only one of its kind to date. Since many timing intervals last longer than 60 seconds, the Chronoscope is finally now available including a minute counter. One possible solution might have been a totalizator, which would have counted each revolution of the sweep chronograph seconds, indicating it on the dial with a hand. There were, however, concrete reasons not to settle for this solution. For one thing, it would have, at the very least, detracted from the harmonious appearance of the regulator dial—if not to say that it would have been a major disruption of such. Aside from which, GerdRüdiger Lang wanted to be true to himself and simply do something different—something out of the ordinary that would also create an entirely new look for Chronoswiss. 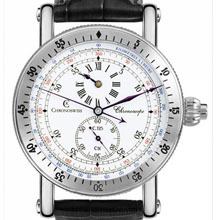 The result is the 2009 unveiling of the brandnew Chronoscope CM (Compteur Minutes). This chronograph wristwatch “with a twist” counts the minutes in a completely novel way once the stopwatch is started— and needs a quick additional step to get going. Once the prominent diamondshaped marking on the easytogrip rotating bezel has been set to the tip of the long minute hand, the duration of the timed event becomes available at a glance; and the days of peering at small, barely visible minute counters of conventional “chronographs” are finally a thing of the past. As a matter of fact, the form chosen by GerdRüdiger Lang offers the additional advantages of a countdown timer. Let’s assume that the time running on a parking meter after inserting some coins is 30 minutes. In this case, it suffices to synchronize the 30minute index with the current location of the minute hand without using the stopwatch; when the hand gets to the diamondshaped marker, it’s time to either move the car or put some more money in the meter. That’s what perfectionist GerdRüdiger Lang is getting at when he talks about functionality. At this point we’d like to draw your attention to the special design of the minute hand: it is exceptionally long and when the observer takes a closer look, he or she will notice that it actually has two tips. The first, shorter, one displays the minutes as usual, while the second one reaches to the edge of the dial, thus pointing directly to the minutes stopped by the chronograph on the rotating bezel’s minute scale when the chronograph is on. It goes without saying that the watchmakers at Chronoswiss pull out all the stops when applying their extraordinary craftsmanship to the art of finishing 26 mm x 6.69 mm automatic Caliber C.125. The skeletonized, goldplated, ballbearing rotor and bridges are resplendent in fine côtes de Genève. The careful polishing of the pallet lever, escape wheel, and screws also fall within the spectrum of distinctive finishing. According to their creator, such masterpieces deserve special hands—which are not only extremely slender and delicate, but also have that particular reddishblue color typical of the hands found on the first mechanical pocket chronographs. Experts called this shade lie de vin in honor of the unavoidable sediment found in valuable old bottles of red wine. The solid case comprising 22 parts certainly has its own style, and although it has been much imitated over the past twenty years, it is simply an impossible act to follow. The distinctive rotating bezel is not only yet another upgrade to the timepiece’s precious waterresistant encasement, but also a further aspect that makes it unique. 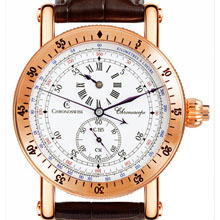 And in the end, each Chronoswiss watch is characterized by aspects of the unique.